Week fifty -woo hoo I have nearly completed one year of this challenge and I have decided where I can to double up on Mary Berry‘s recipes from her Baking Bible otherwise it would take me two and a half years just to finish her book! As you may have noticed from last week, I have an apple tree in my garden and due to the exceptional weather this year, I have an abundance of apples and despite giving loads away, I still have loads. 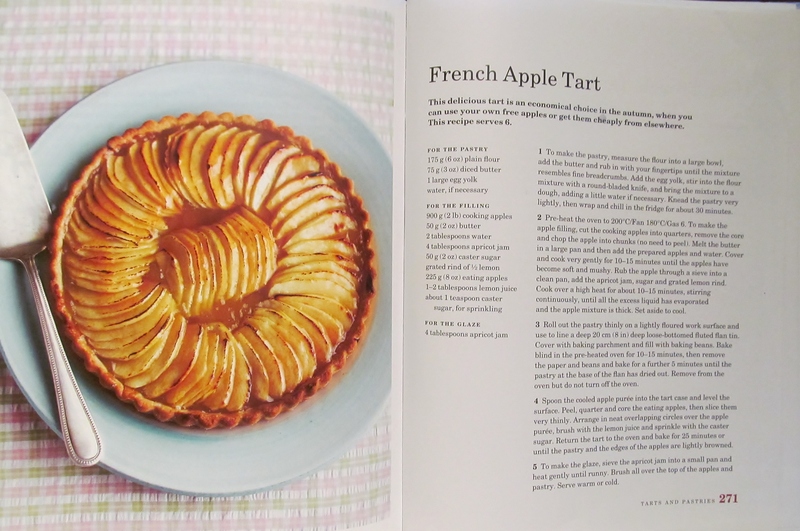 The first recipe was Mary’s French apple tart which I started on the Friday when I made the pastry and the apple puree for the sauce and put together on Saturday. I got to use my little ceramic blind baking beads for the first time in the challenge to bake the base of the tart before the filling went in. Next went in the apple puree that had taken ages to make because you have to cook the apples and then push it all through a sieve..zzzzz. such an exciting time! Finally I peeled, cored and sliced the top apple and arranged it like Mary’s tart and in it went for it’s final bake. I was pleased with the results. 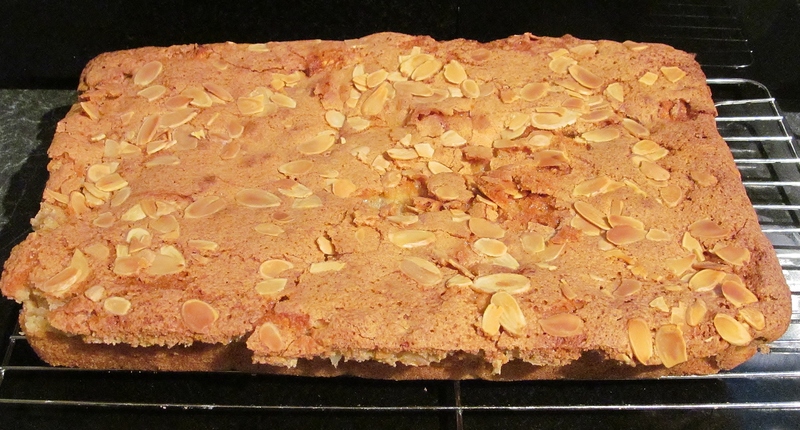 the second recipe was Mary’s Devonshire apple cake which used up some more of my apples! Mary asks you to make a sponge mix and cut your apples into small pieces. I used a traybake tray from Lakeland ( my favourite shop) and poured half the sponge mix in, then added the apples and topped it with the rest of the sponge mix. Mary says that this cake doesn’t look particularly attractive but tastes nice warm with cream. I topped it with some sprinkled almonds as per the recipe and set the timer. This was a long bake and I set to a little more baking ( not Mary’s recipes) while I waited. I set the bread machine off with a white crusty loaf, made some mini apple pies and some honeycomb. The final result of the Devonshire cake was better than I expected. I thought it looked nice. I cut it in half, put half on the freezer and sent some slices of this and a slice of the tart to hubby’s parents who are also chief tasters! I can’t wait for the Great British Bake Off this week, I am so enjoying this series and still support Frances in her creativity, although I think Ruby is shining through now too. 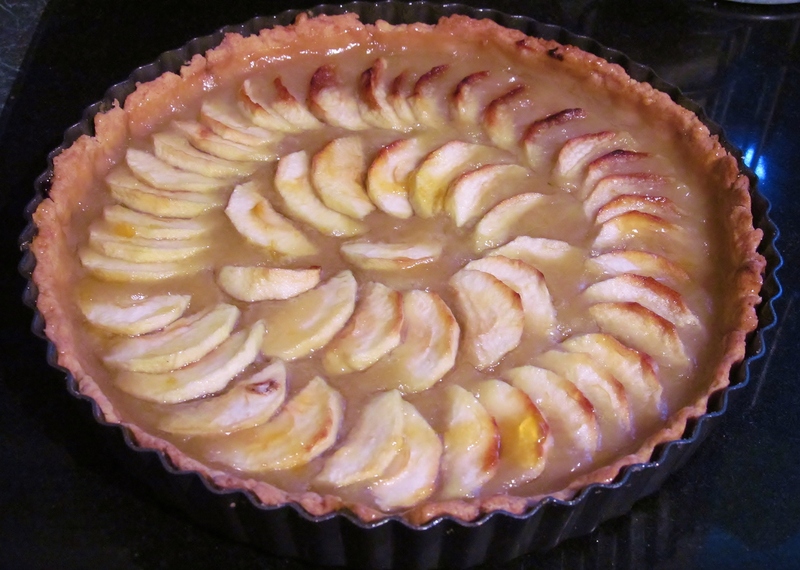 This entry was posted in Kim's cake challenge and tagged Apple, Apple cake, Baking Bible, Great British Bake-Off, Home, kims cake challenge, Mary, Mary Berry, Mary Berry Devonshire Apple Cake, Mary Berry French Apple Tart, Norman Tart by kimsideas. Bookmark the permalink. Our Daughter (In Law) is definately the “Queen of Tarts”! 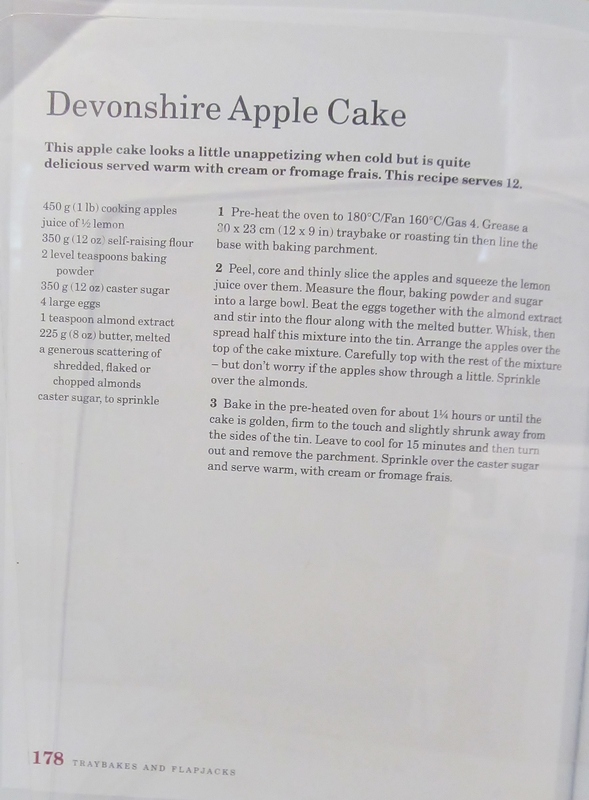 !, but ooh you should try her Devonshire Apple cake. Did she make it or was it despatched from Heaven?